Mayor Scott Smith is in the middle of his first term as the Democratic Mayor of New Milford Borough. He served as President of the New Milford Borough Council for six years of his 9 year stint from 1999 – 2007. Scott took a break from serving his New Milford community until he was asked to run for mayor. He thought it a good idea and won his election in 2014. Scott says it is a challenge being a Democrat in our heavily Republican county and he wishes there were more of us. But, he also feels that people must vote for the person who’s best suited to the job — no matter what their party affiliation. He enjoys being the Mayor of New Milford for a number of reasons, but he particularly likes being a “conduit” between the Council and the residents of his Borough. The people bring their concerns to him and he relays them to the Council and is in on the discussions and contributes to the solutions that make the Borough of New Milford run smoothly. He is the tiebreaker when the Council is unable to reach a majority. He particularly likes coming up with ideas to better his community. Improving amenities, like the town’s two parks, and adding to the aesthetically pleasing feeling of New Milford, with their Main Street flag display for example, are his specialties! As Mayor he is able to say, “Let’s beautify our town and make things look good,” without having to work on the budget. That is the Council’s job. Of course it is not all fun and games. Currently Mayor Smith and the Borough Council must deal with the proposed New Milford Township incinerator threat and how they can best protect their town. They are currently working on a new comprehensive plan to look at how to lessen the impact of the incinerator should it go through, ways to improve their road conditions and how to best keep their town clean and safe. Mayor Smith is proud to be a resident and mayor of New Milford Borough. He likes that people come to him with problems, hopeful that he can help. Although he knows that you can’t make everyone happy, he works to please the majority and to accomplish what is in the best interest of his small community. Scott works with Great Bend Borough to schedule the police that they share, arranging for the police to be on hand for special events. The Mayor and the Borough Council have initiated a “Coffee With A Cop” campaign to help the police meet and know who the citizens of New Milford are and vice versa. Mayor Smith grew up in New Milford and he is particularly interested in getting new trees positioned where the old ones have disappeared. His ideas about keeping the parks in good shape, adding the flags, and new plantings are all ideas he gets to present to the people of New Milford. 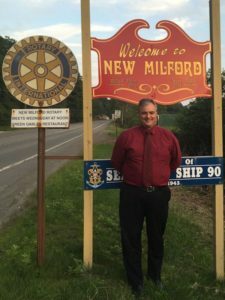 Scott serves on the town’s Beautification Committee and one of his goals is to make New Milford as good as it can be. Even though Mayor Smith is not retired, as mayors in the past, Scott wants to follow in their exemplary footsteps. Scott is not available during the day for people to approach but he is very committed to keeping New Milford a “Rockwellian” town that people love to live in and love to visit! Mayor Smith wants to be around for the long term and appreciates the opportunity to serve New Milford Borough now and hopefully in the future. He enjoys being a resident of New Milford and is glad to be a part of the Town’s success!